Photograph; a black and white, landscape-oriented photograph mounted onto a pale card backing. The photograph has a hand-drawn red pencil border. 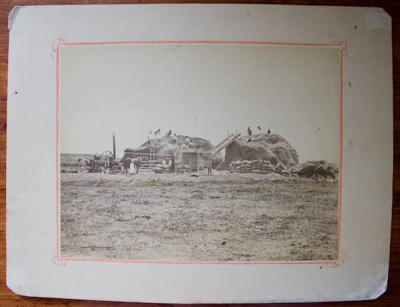 It depicts two large mounds of hay on top of which stand a group of men. In between the two mounds is a large hay press, and sacks of hay are seen below each mount. To the left is a large steam-powered engine, and two horses are visible also. Other individuals, including a girl in a white dress, are also visible. On the reverse is written 'Pitches / paddock / Ophir', and 'Mr E Drake'. The name 'Pitches' most likely refers to John Pitches, the owner of the General Store, Ophir. John was a prominent figure in the town and was elected to the Manuherikia Riding (ridings existed in rural New Zealand in the late 19th and early to mid 20th century as part of larger county councils) in 1876. In 1877 he campaigned (unsuccessfully) for the county offices to be sited at Ophir. A Mrs W Drake was postmistress at Ophir Post Office circa 1930s.